And it’s a wrap for the 9th KLEFF 2016! Here’s a big thank you to all the 2016 sponsors, partners, collaborators, interns and kleff crew! We wouldn’t be able to do this without your support and faith. 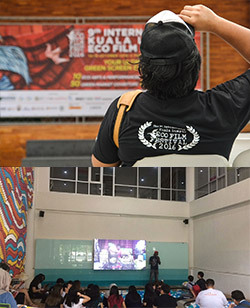 The past weekend at MAP Publika experienced a different kind of eco vibe as the 9th Kuala Lumpur Eco Film Fest (KLEFF) took place at the shopping gallery from the 14th – 16th October 2016. The festival itself saw the culmination of various important partners and stakeholders ranging from indigenous advocacy groups, to environmental NGOs, film making experts and production houses, to green entrepreneurs. It takes a lot of dedication, commitment and hard work to make this event happen. It is my hope that we find enjoyment in doing this and can continue to grow our volunteer network. I would also like to thank our sponsors and partners for without their financial and in-kind support we would not be able to put on our festival- so please utilise their goods and services when you can and help show them our support. I look forward for our 10th International Kuala Lumpur Eco Film Festival 2017, and I can assure you that it will be better. The dates will be confirmed very soon, so hang in there and till we meet again! So to take you through some of the exciting components of the recent festival, do check out the festival highlights reports below. The 9th KLEFF award ceremony was held before the opening night of the Malaysian film screenings and was a full house with attendees that are from the film makers (local and international), representatives of sponsors, partners and also supporters. We would like to congratulate all the film makers who won the respective categories, and a massive shout out to all that has supported us to make the awards ceremony special. Read more about the winners of this year’s film festival competition. For all three days throughout the festival, the film screenings have been a success and saw the attendance of close to 1050 registered number of people who attended the screenings. A total of 85 films were screened to the public, representing 45 countries. The film screening was led by EcoKnights, Nurul Syahira, Farhanah Adam Malik and Lhavanya, supported by their amazing crew of volunteers. The film screening was held for three days from 14th to 16th October 2016 at Black Box, Publika. The first day of the festival was kicked-off with the Awards Ceremony announcing the winners from a total of eight categories! The organizer was pleased to welcome international film makers as well as local film makers who came all the way to Kuala Lumpur for this festival. After the Awards Ceremony, the event then continued with the screening of films that are made from Malaysia. We were indeed proud to show the amazing films that were submitted for this festival by talented Malaysians. Most of the films that were screened were submitted by Malaysian students who came from our university partners. Over the weekends, we screened films that were made from all over the globe, showcasing environmental issues from various perspectives. We have also invited film makers who came for the festival to share with the audience on their films. Based on the data that was gained, a total of 1001 people came for the films screening. There were 604 people for three days who had registered on the day and 397 people registered online. We also learned from the data, that the film that as recorded the highest number of audience was “FREIGHTENED: The Real Price of Shipping” with a total of 311 people. The synopsis of the film: 90% of the goods we consume in the West are manufactured in far-off lands and brought to us by ship. The cargo shipping industry is a key player in world economy and forms the basis of our very model of modern civilisation; without it, it would be impossible to fulfil the ever-increasing demands of our societies. Yet the functioning and regulations of this business remain largely obscure to many, and its hidden costs affect us all. Due to their size, freight ships no longer fit in traditional city harbours; they have moved out of the public’s eye, behind barriers and check points. The film answers questions such as: Who pulls the strings in this multi-billion dollar business? To what extent does the industry control our policy makers? How does it affect the environment above and below the water-line? And what’s life like for modern seafarers? Taking us on a journey overseas and oceans, FREIGHTENED reveals in an audacious investigation the many faces of world-wide freight shipping and sheds light on the consequences of an all-but-visible industry (please visit freightened.com to learn more about the film). A total of 50 NGOs and green businesses participated in this year’s Green Market and we are happy to hear that many of them were positive with the reception from the public. A green shopping experience, where no plastic bags, polystyrene and Styrofoam were used to store purchased items, walking around the area with a feeling of seeing only eco-friendly products and organic decorative plants as well as keen people demonstrating a proper way to take care of the environment and how to achieve a green lifestyle. This was the exact scenario of this year Green Market @KLEFF2016 in Publika on the 15th and 16th October 2016. Each vendor carried different green product but with the same goal of promoting green purchase. Various products ranging from household products to organic body care up to attractive decorative plants were featured this year. Up to 50 booths were featured in this year’s Green Market and most of them were satisfied with the overall organizational structure and the mechanisms of this event. There were other well-known brands such TLC (Truly Loving Company) that sells eco-friendly household products which is a magnificent effort to promote healthy and green lifestyle because every wise behaviours starts from a healthy household. It was very interesting to see how these vendors that might not share the same items to sell, but they believe in a common notion that green products are essential to promote a better environment to the current and future generations. This is the kind of belief that most people think that it is a waste of time, people would not even bother to know what is a green product and how importance to engage in green purchase these days. These kinds of sentiments of the vendors will hopefully allow them to be more successful in spreading the good cause as well as educating the public on the importance to shop green as every purchase carries an environmental value and it is up to the buyers to choose whether the items that they bought would give a benefit or harm the environment even in the smallest value. Therefore, Green Market hopefully able to serve as the main centre for the public to know what is green purchase, how is it works as well as educating the public the importance in buying and consuming green products on the daily basis. The KLEFF would not be complete without the arrangement of impressive fringe performers at the festival. We had amazing performances by our local music talents such as No Noise Percussion, Ian Tai, Shaman Elite, Markiza & Peter and many more. DTOLJ, an indigenous dance group, kept the crowd going by inviting them to join in the cultural dance whereas street magician Ross Stephenson entertained the audience at the Square with his magic tricks and friendly personality. This year, 10 workshops have been successfully conducted throughout the festival. With total of 174 people attending this workshop, its shows that green-knowledge is still in demand. These workshop varies from farming to lifestyle have attracted the visitors to come to our festival. Most notable workshop was ‘Films for Environment’ which was conducted by Harun Rahman and Lara Ariffin. In this session, Harun and Lara both share their experiences and challenges that they are facing for their newest documentary ‘Harimau Selamanya’. This workshop have attract youth especially university students to come participating in this workshop. – quote from Harun Rahman when ask either is it hard to filming animals by the audience. Other than Harun and Lara session, Florent Mamelle and Christian Senat also shares their experiences in photographing where both are expert in volcanoes and macro photographing respectively. Meanwhile at the Black Bridge, there are another workshop going on. This year, we have our partner, Tanamera, conducting their workshop about Self-Massage. This workshop was conducted by Dr. Baskaran Koshti, a renowned massages expert. Other than Tanamera, we have our friends such as Poptani and CETDEM conducting their workshop here in KLEFF. This year, we also have Urban Growers teaching about hydroponics in their workshop. They gave an in-depth explanation on how to build your own hydroponics system in your house. At the same time, EcoKnights also conducted their own kind of workshop; Composting, Eco-enzyme, and Seed-bomb, throughout the festival. This year marked our first partnership with GreenTech Malaysia and GreenTech Catalyst under the purview of the Ministry of Energy, Green Technology and Water (KeTTHA). 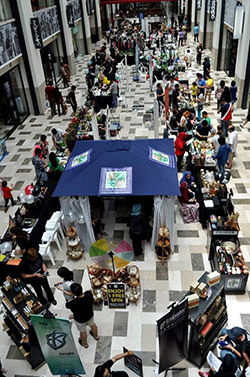 In collaboration with the Ministry of Energy, Green Technology and Water (KeTTHA) and Malaysian Green Technology Corporation (GreenTech Malaysia), the 9th KLEEF hosted the Jom Beli Produk Hijau carnival which featured 12 green companies offering over 50 certified green products under the Ministry’s MyHIJAU Programme to encourage consumers to switch to green purchasing. These companies included Kloth Malaysia, Esona Technologies, Nippon Paint, Nature Profusion and Paragon Carpetmaker. The carnival was launched by Y.B. Senator Dato Sri Devamany a/l S.Krishnasamy, Acting Deputy Minister II of KeTTHA. The 2-day carnival on 15th and 16th Octover also featured various complementing activities including the ‘Green Vibes’ talk by social activist Syed Azmi, colouring competitions and prizes including a free ride in the world’s best electric vehicle, the Tesla Model S 85. The MyHIJAU Programme, launched in 2015, has registered over 270 green products and services, and certified 78 companies under MyHIJAU Mark recognition scheme as of September 2016. KLEFF 2016 wouldn’t have been successful without the support of our amazing and passionate volunteers who worked as hard as the KLEFF team. We would like to thank the volunteers for all their help and we hope that you’ve gained good memories as well as valuable experiences in KLEFF. In order to gain feedback regarding the volunteer experience during KLEFF 2016, feedback forms were handed out to volunteers and direct interviews were conducted with some of them. One of our first-time volunteers, Ms. Amanda said, “I volunteered for KLEFF unknowingly and definitely enjoyed myself making new friends and gaining experience”. Another volunteer, Ms Shu Yan mentioned that, “KLEFF 2016 has given me the opportunity to engage with like-minded individuals that have helped me to expand my knowledge and sensitivity towards the current environmental issues. I enjoyed my eye-opening volunteering experience with EcoKnights and hopefully be back next time!”. The area leaders of the festival also found meeting volunteers from different backgrounds to be an interesting experience. “I met a lot of people with in-depth knowledge about going green, and surprisingly some of them were among the volunteers!” said Ms Jae Mie, the photography area leader. 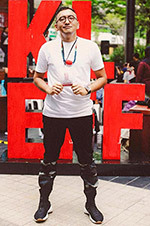 Meanwhile, Mr Emirul, the area leader for workshop said, “Throughout the festival, the volunteers have been very helpful and followed the instructions given. In fact, some of them have been volunteering for a few years and I learnt many things from them”. We will be celebrating Kuala Lumpur Eco Film Festival’s 10th Anniversary next year!! And we are really pumped to reveal the new 2017 KLEFF look very soon! Meanwhile, we are now calling for partnerships, sponsorships and collaborations with any interested companies or organizations who are interested to be part of the 2017 KLEFF. Sponsoring KLEFF provides excellent brand visibility, opportunities to interact with our large and engaged audience, and the chance to be part of one of the country’s major environmental events. Unique sponsorship opportunities (corporate screenings, filmmaker lounge, special events, etc.) may also be available upon request. For more information on sponsoring KLEFF, contact the Festival Director, Fadly Bakhtiar (603 7731 8361, fadly@ecoknights.org.my) or Festival Coordinator, Nurul Nabila (603 7731 8361, nabila@ecoknights.org.my).